A number of people asked us what they should do in order to be logged out of Facebook Messenger. Some may want to log back in with a different account, or didn’t like the experience. In any case, just follow the steps below and you’ll be on your way out. : Head on to the settings menu. Step #2: Scroll down to look for “Apps” option and tap on it. Step #3: Now, you can observe the list of all the apps installed on your device. Scroll down to find “Messenger“. Note: If you have Google’s Messenger app installed, do look for the icon to identify the correct application. Step #4: Tap on the desired app (i.e Facebook Messenger). Step #5: Head to the storage menu as shown in the image above. 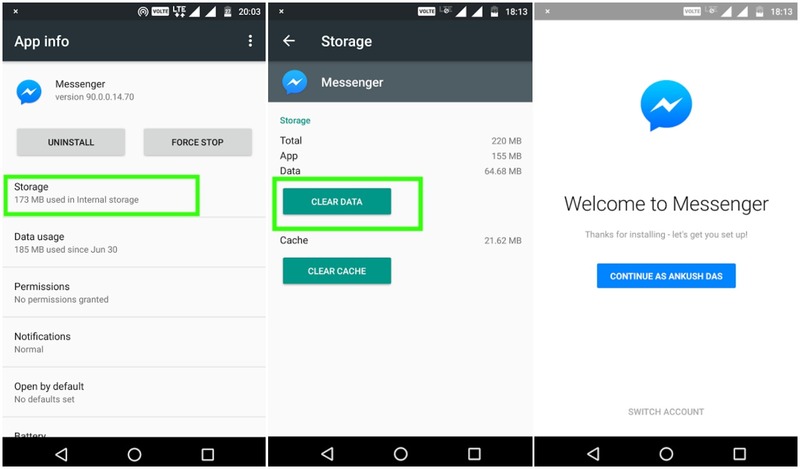 Step #6: You should now observe two options – “CLEAR DATA” and “CLEAR CACHE“. Just click on “CLEAR DATA“. And, you have successfully logged out from the Facebook messenger app. : Tap and hold the Facebook messenger’s app icon on the homescreen or right from the app drawer. Drag the icon near to the “Edit” option or “Info” option. If you observe the “info” option instead “Edit” , you can skip the next step. Step #2: In this case, we have “Action Launcher 3 Plus” installed. So, we have to tap on the “i” icon as shown in the image above. Step #3: Now, you can head on to the storage menu and then click on “CLEAR DATA” just as you did whennavigating through the settings in the previous section. Finally, you have logged out of Facebook messenger. However, if you are logged in to the Facebook app, you can log into the Facebook messenger again by just a single tap. 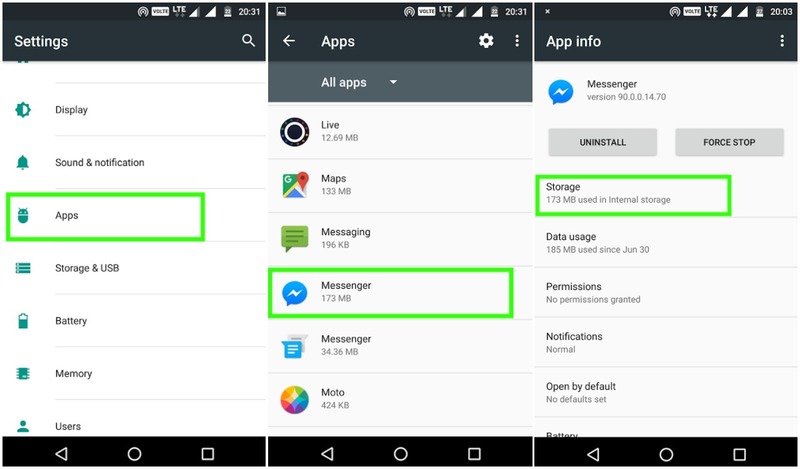 On the off chance, if you are not using the Facebook app on your Android device, you will be asked for your credentials when you open the Facebook messenger next time.